American artist Ed Ruscha (born 1937) was born in Nebraska and raised in Oklahoma. In 1956 he moved to Los Angeles to attend the Chouinart Art Institute, and had his first solo exhibition in 1963 at the Ferus Gallery. In the 1960s his paintings and graphic works of Standard gas stations and other commercial logos brought him to prominence as a leader of West Coast Pop Art. 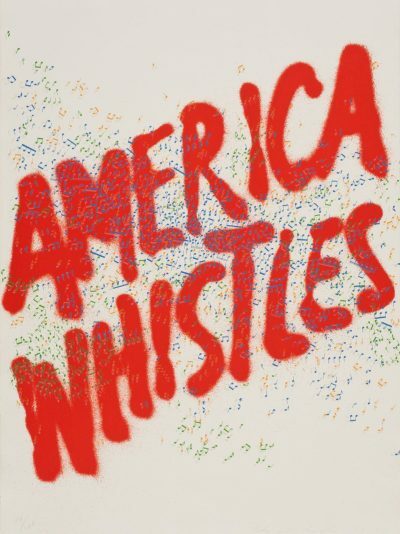 In 2001 Ruscha was elected to the American Academy of Arts and Letters as a member of the Department of Art. In 2005 he was the United States representative at the 51st Venice Biennale. Ruscha has been the subject of numerous museum retrospectives that have travelled internationally including those organised by the San Francisco Museum of Modern Art in 1982; the Centre Georges Pompidou in 1989; the Museo Nacional Centro de Arte Reina Sofia in 2002; and the Whitney Museum of American Art in 2004.